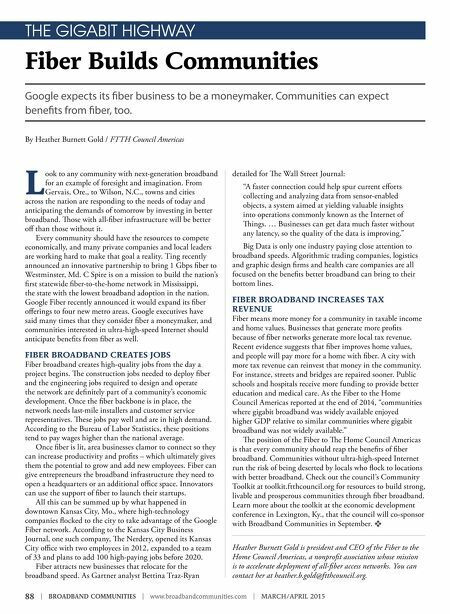 88 | BROADBAND COMMUNITIES | www.broadbandcommunities.com | MARCH/APRIL 2015 THE GIGABIT HIGHWAY Fiber Builds Communities Google expects its fber business to be a moneymaker. Communities can expect benefts from fber, too. By Heather Burnett Gold / FTTH Council Americas L ook to any community with next-generation broadband for an example of foresight and imagination. From Gervais, Ore., to Wilson, N.C., towns and cities across the nation are responding to the needs of today and anticipating the demands of tomorrow by investing in better broadband. Tose with all-fber infrastructure will be better of than those without it. Every community should have the resources to compete economically, and many private companies and local leaders are working hard to make that goal a reality. 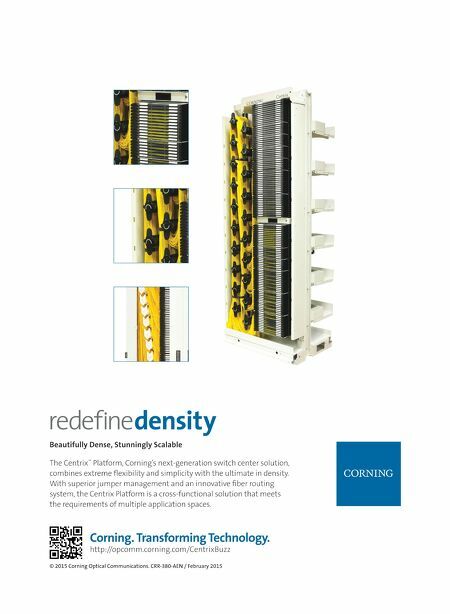 Ting recently announced an innovative partnership to bring 1 Gbps fber to Westminster, Md. C Spire is on a mission to build the nation's frst statewide fber-to-the-home network in Mississippi, the state with the lowest broadband adoption in the nation. Google Fiber recently announced it would expand its fber oferings to four new metro areas. Google executives have said many times that they consider fber a moneymaker, and communities interested in ultra-high-speed Internet should anticipate benefts from fber as well. FIBER BROADBAND CREATES JOBS Fiber broadband creates high-quality jobs from the day a project begins. Te construction jobs needed to deploy fber and the engineering jobs required to design and operate the network are defnitely part of a community's economic development. Once the fber backbone is in place, the network needs last-mile installers and customer service representatives. Tese jobs pay well and are in high demand. According to the Bureau of Labor Statistics, these positions tend to pay wages higher than the national average. Once fber is lit, area businesses clamor to connect so they can increase productivity and profts – which ultimately gives them the potential to grow and add new employees. Fiber can give entrepreneurs the broadband infrastructure they need to open a headquarters or an additional ofce space. Innovators can use the support of fber to launch their startups. All this can be summed up by what happened in downtown Kansas City, Mo., where high-technology companies focked to the city to take advantage of the Google Fiber network. According to the Kansas City Business Journal, one such company, Te Nerdery, opened its Kansas City ofce with two employees in 2012, expanded to a team of 33 and plans to add 100 high-paying jobs before 2020. Fiber attracts new businesses that relocate for the broadband speed. As Gartner analyst Bettina Traz-Ryan detailed for Te Wall Street Journal: "A faster connection could help spur current eforts collecting and analyzing data from sensor-enabled objects, a system aimed at yielding valuable insights into operations commonly known as the Internet of Tings. … Businesses can get data much faster without any latency, so the quality of the data is improving." Big Data is only one industry paying close attention to broadband speeds. Algorithmic trading companies, logistics and graphic design frms and health care companies are all focused on the benefts better broadband can bring to their bottom lines. FIBER BROADBAND INCREASES TAX REVENUE Fiber means more money for a community in taxable income and home values. Businesses that generate more profts because of fber networks generate more local tax revenue. Recent evidence suggests that fber improves home values, and people will pay more for a home with fber. A city with more tax revenue can reinvest that money in the community. For instance, streets and bridges are repaired sooner. Public schools and hospitals receive more funding to provide better education and medical care. As the Fiber to the Home Council Americas reported at the end of 2014, "communities where gigabit broadband was widely available enjoyed higher GDP relative to similar communities where gigabit broadband was not widely available." Te position of the Fiber to Te Home Council Americas is that every community should reap the benefts of fber broadband. Communities without ultra-high-speed Internet run the risk of being deserted by locals who fock to locations with better broadband. Check out the council's Community Toolkit at toolkit.ftthcouncil.org for resources to build strong, livable and prosperous communities through fber broadband. Learn more about the toolkit at the economic development conference in Lexington, Ky., that the council will co-sponsor with Broadband Communities in September. v Heather Burnett Gold is president and CEO of the Fiber to the Home Council Americas, a nonproft association whose mission is to accelerate deployment of all-fber access networks. You can contact her at heather.b.gold@ftthcouncil.org.